Audio: Armond WakeUp releases "East St Louis, IL (Santorini Greece Freestyle)"
Powerhouse vocalist MARi partnered with NewReleaseToday.com for yesterday’s exclusive World Premiere of her ”Shine Brighter” music video. The inspirational dance track is the first single from her debut album, Treasure, which releases on May 27th via Nashville-based Elevate Entertainment and Syntax Distribution. 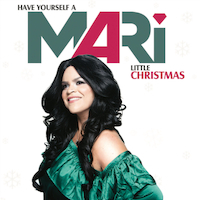 Hailing from Queens, New York, MARi brings an energetic hybrid of dance, pop, latin and reggae to the Contemporary Christian Music arena. But listeners will find equally bold lyrics that openly inspire and challenge people to shine brighter for the Savior. MARi is managed by Michael Smith & Associates and booked by Behind the Voice Agency.